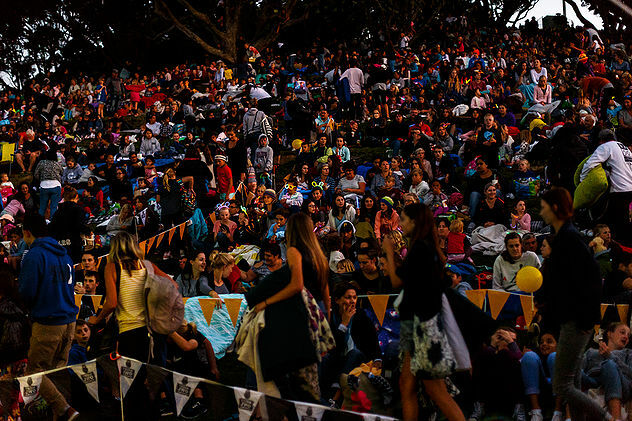 Watching Moana under the stars was a popular choice for a record crowd at Mount Drury in Mount Maunganui on Friday night. The Young Innovator Awards teamed up with outdoor movie experience Night Owl Cinema to launch the 2017 awards before the movie screened. Cath Waller was able to secure VIP seats for herself and son Flynn, age 9. More than 4000 people were reported to have attended the event. I saw people arrive and leave as it was too busy. There were even people sitting on the road. With daylight saving hours changing, Disney's latest animation blockbuster Moana was able to be screened at an earlier time than previous film events, after 6pm. It had a lovely atmosphere, so nice to sit and watch the lovely view while enjoying our dinner waiting for the movie to start. The film was the last screening of the season at the Mount Drury location.